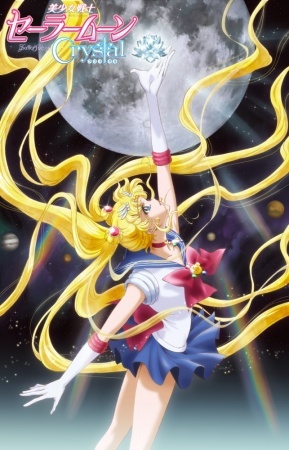 New Sailor Moon anime commemorating the 20th anniversary of Sailor Moon. Usagi Tsukino is a second-year middle school girl who is a little clumsy and a crybaby, but she is full of energy. One day, she meets Luna, a black cat with a crescent moon on her forehead, and she transforms into Sailor Moon, a sailor-uniformed pretty guardian of love and justice! As a chosen guardian of justice, Usagi seems to have a mission to find the Illusionary Silver Crystal with the other guardians and to protect the princess. Meanwhile, the queen of the Dark Kingdom, Queen Beryl, also sends minions to the town where Usagi lives to obtain the Illusionary Silver Crystal, which has immense power. This causes strange events to unfold…. Can Sailor Moon really find the Illusionary Silver Crystal with the other Sailor guardians, and protect the princess…!? Watch Bishoujo Senshi Sailor Moon: Crystal Episodes Online at Animegg.org. Bishoujo Senshi Sailor Moon: Crystal is available in High Definition only through Animegg.org. Choose an episode below and start watching Bishoujo Senshi Sailor Moon: Crystal in Subbed & Dubbed HD now.